Cannon Beach est classé parmi les 10 plages mondiale. Notre Retreat Home est niché sur une colline dans Tolovana Park avec vue panoramique à couper le souffle de Haystack Rock, l'océan Pacifique et Cascade Range Mtn. Trois terrasses pour prendre le soleil, manger, lire. Descendez la voie pour atteindre les étapes de la plage et la côte. Miles de plage pour marcher sur le nord et le sud. Promenez-vous en ville pour le déjeuner, des galeries d'art, boutiques. Trois niveaux de vie ensoleillées sont idéales pour votre famille de vivre des vacances côte de l'Oregon. La suite au dernier étage supérieur a une grande chambre avec cheminée, sofas, lit Queen, Master bain privée, deux ponts de vue et une alcôve de lits jumeaux. À l'étage principal: Open Galley cuisine avec de nouveaux appareils en acier inoxydable, TV Grande Chambre a une rivière Cheminée en pierre, grande salle à manger, salle de soleil, salle de bain complète. Niveau de la lumière du jour Basse dispose de deux chambres à coucher de la Reine-privés, salle de bain complète, plus 3 lits jumeaux dans la chambre et la salle de soleil espace ouvert chambre. Mots-clés: Trois histoires de l'art de vivre. Vues panoramiques. Près de la plage et de Haystack Rock. The house was perfect! The main living area was wonderful for 7 people to gather for meals, conversation and quiet corners to read. Jami graciously offered us another day because of the weather...so nice. We would come back. Loren, thank you for the review! I am so glad the house accommodated your family perfect. Thank you for treating our home so lovely as well! Look froward to having you rent with us again! Beautiful home, perfect location, our new Cannon Beach fave. The house was stunning and the location couldn’t have been better. Enjoyed being so close to a surf spot which was the intent of our trip. 9 people stayed comfortably in the house and it was perfectly set up for us to be able to cook meals while playing games and watching movies. TV is small, and the volume/DVD player was a little dated so it did make watching our annual traditional Point Break, Goonies medley a bit difficult. But a small complaint overall. Great place and it’s definitely top of our list for our next trip!! Thanks, Fiona! We are so glad you had a fabulous stay! Yes, we are considering a larger TV in the main room! 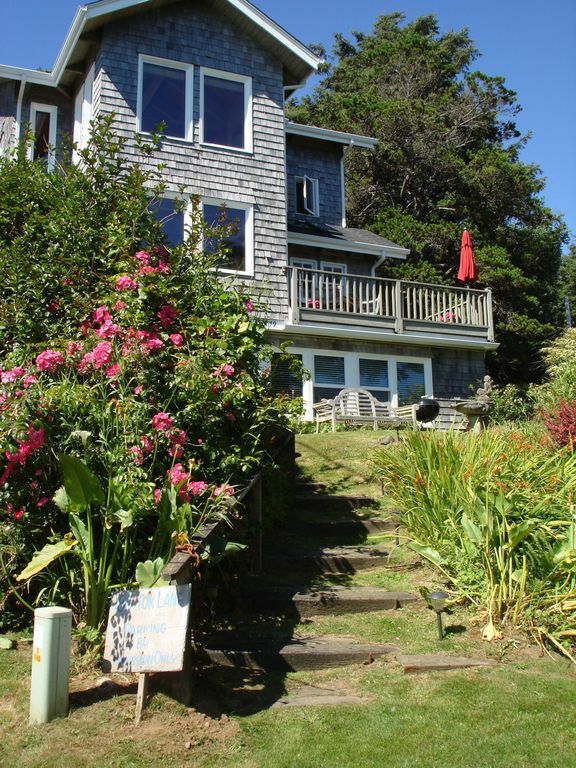 House was great, super close to Haystack Rock and great views to the south. Thanks, Jonathan! We are so glad you enjoyed the stay and the views - some of the best on the Oregon Coast!! Great place to stay! Plenty of rooms and space. Nice quiet location just a few steps away from the beach. Kitchen was easy to cook in. Close to the city center. All of us would stay here again. This place is fabulous -- in all ways. It's located in a mellow, quiet, relaxed part of one of the nicest towns on the Oregon Coast, along one of the most stunningly beautiful -- yet uncrowded --beaches in the world. The home is on a tiny little lane just steps from easy beach access and a fifteen minute stroll through more lovely lanes, with resident wild bunnies, to a local bakery, grocery store and historic pub. The house is really large (even bigger than it seems in the photos) and can easily accommodates three couples plus kids, with plenty of private nooks for all. It has a well-appointed kitchen that looks out on a comfortable great room where we all hung out very happily. It also has fabulous deck spaces and a new gas grill, which we also thoroughly enjoyed. The place feels like a real family home that has been enjoyed, maintained and equipped by people who truly love it. Our family loves it too, and felt so at home and relaxed and lucky to be there -- it was hard to leave. The owners were friendly, responsive and very easy to deal with. Highly recommended! Jami was great to work with, house was good, views are great. Recommend it!! Thank you for the 5-star review. I am so glad you had a great stay at Sea Haven! I agree, one of my favorite views of the Oregon Coast!! Courte promenade 1 bloc vers le bas Tok Lane pour accès à la plage, des miles de sud ou le nord de la randonnée. Haystack Rock 3ème plus grand monolithe naturel dans le monde est à cinq minutes de marche de la plage, explorer les bassins de marée, des habitats écologiques. Village de Cannon Beach est à 20 minutes à pied de plage; boutiques pittoresques, des restaurants, un paysage magnifique. Reservation is confirmed by receipt of signed contract and 1/2 of nightly rental payment. Not included in nightly stay is a $200 Cleaning Fee and $400 REFUNDABLE security deposit. These payments to be included in final payment due 14 days prior to stay. During the Thanksgiving and Christmas Holiday the minimum stay is 4 nights.